CommonKindness.com is adding more choices for natural Glee Gum on its free, printable grocery coupon website. Consumers can now clip and save on Sugar-Free Glee Gum made with xylitol, a natural sweetener that fights oral bacteria and builds stronger teeth. Manufacturer Verve, Inc, and free printable grocery coupon leader CommonKindness.com are giving gum aficionados more reasons to smile with new, free online coupons for tooth-friendly Sugar-Free Glee Gum. Glee Gum coupons help shoppers both save money and make a contribution to their favorite nonprofit organizations with every coupon purchase. Glee Gum is available in sugarless, xylitol-sweetened Lemon-Lime and Refresh-Mint flavors, as well as Peppermint, Cinnamon, Spearmint, Triple Berry, Bubblegum, and Tangerine flavors sweetened with FAIRTRADE Certified cane sugar. “Verve is an innovation leader in the world of chewing gum, and we are proud to have Glee Gum in our partnership of high quality brands that are working together to help create sustainable funding for America’s nonprofit organizations,” said Sarah Schloemer, president of CommonKindness. Unlike artificial sweeteners such as aspartame, sucralose or Splenda, xylitol is an organic compound that occurs naturally in fruits, vegetables, and trees, according to Verve. The company says that xylitol is often recommended by doctors for diabetic patients who chew gum because it contains 40% fewer calories than equally-sweet amounts of sucrose, or table sugar. Research over four decades shows that xylitol starves harmful bacteria in the mouth and helps prevent plaque from building up on teeth, thus improving oral hygiene and health. In fact, chewing gum made with xylitol as the principal sweetener is endorsed by six national dental associations. Because the xylitol molecule contains five carbon atoms—not the six found in sorbitol, fructose and glucose—it does not break down and provide fuel to bacteria of the mouth like those sugars. Instead of being metabolized, xylitol inhibits bacteria from producing tooth-destroying lactic acid. At the same time, chewing xylitol-sweetened gum increases the flow and pH levels of saliva, calcium, and phosphate salts, which repair and strengthen tooth enamel. Xylitol was discovered in 1891 by German chemist Emil Fischer, but it was not appreciated until it became popular during the sugar shortages in Finland during World War II. Since then it has become a sweetening agent in foods, pharmaceuticals, and oral health products in more than 35 countries. In 1983, a joint expert committee of the World Health Organization and the Food and Agriculture Organization of the United Nations confirmed that xylitol is a safe sweetener for foods. The U.S. Food and Drug Administration confirmed this finding independently in 1986. The xylitol used in Sugar-Free Glee Gum is harvested from beech and birch bark in a unique production method using 85% less energy than extracting it from corn. The technique integrates sustainable forestry practices that results in a 90% reduction in the carbon footprint when compared to conventional processes. To find and use coupons for Glee Gum, shoppers can go to CommonKindness.com, quickly register for free, and designate their favorite nonprofit from the user-friendly directory. They then clip printable grocery coupons for items they typically use or want to try, and head to the store. For each coupon redeemed, CommonKindness provides 20% of the distribution fee it receives to the shopper’s designated nonprofit group. CommonKindness is the new online grocery coupon site that operates on the principle of kindness and aims to benefit consumers, nonprofit organizations, and brands. CommonKindness is revolutionizing the online coupon industry by eliminating coupon loading and change costs, charging brands only for coupons redeemed, and giving 20% of its revenue to nonprofit organizations. Glee Gum is the only gum in North America made with chicle, a tree sap sustainably harvested from the rainforests of Central America. At one time, all chewing gum was made with chicle, but today most gum is made entirely from synthetic ingredients. Chicle gives Glee its long-lasting chewing texture. All Glee Gum is aspartame free, GMO free, and certified vegetarian. It contains no additives, dairy, wheat, gluten, yeast, nuts, peanuts, or soy. Sugar-Free Glee is also corn free. 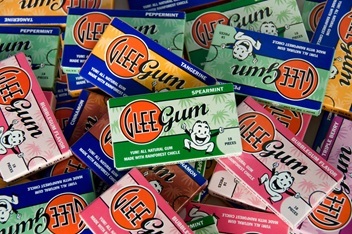 Glee Gum is packaged in biodegradable, recycled cardboard. Classic Glee Gum is sweetened with FAIRTRADE Certified cane sugar and brown rice syrup. 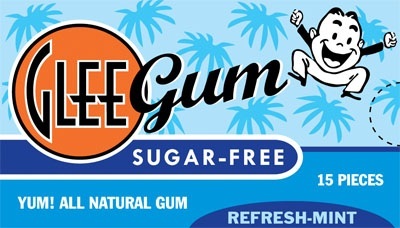 Sugar-Free Glee Gum is sweetened with 100% xylitol, sustainably produced from American birch and beech trees. Xylitol is a safe alternative to artificial sweeteners, and has been proven to benefit dental health. To learn more, visit http://www.gleegum.com or call (401) 351-6415. This entry was posted in coupons, Kindness, marketing, nutrition, school fundraising and tagged acts of kindness, brand marketing, chewing gum, commonkindness, coupon marketing, coupons, dental health, dental hygiene, grocery store coupons, gum coupons, kindness, online coupons, random acts of kindness, strong teeth, xylitol by CommonKindness. Bookmark the permalink.